Play only if there are at least 3 cards in HQ. Trash all cards in HQ. Place a total of 2 advancement tokens on up to 2 cards that can be advanced. Does Audacity count itself toward the required number of cards in HQ? 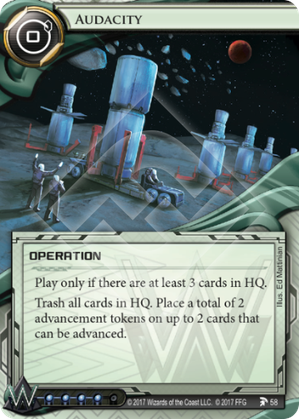 One of the three Jemison Tagline cards (Sacrifice, Audacity, and the upcoming Success) This is a pretty powerful FA tool for Weyland players fine with dumping HQ. The ability to potentially FA 2 cards with Shipment from Kaguya is very interesting and is worth experimenting on. Otherwise I'd use the other 2 adv tokens on an advance ICE like Mausolus or Colossus. The trashing HQ downside is somewhat unfortunate, but you can play it to your advantage. Maybe you are running Argus Security: Protection Guaranteed and you want to get the runner to poke archives full of 1 pointers. Maybe you feel that a Legwork is coming, so you can trash your agendas and have Jackson Howard come to the rescue. All in all I think this is a "specialty" Fast Advance Tool useful for a deck that wants to Advance ICE and agendas. Red Planet Couriers, I'm looking at you!